The Song Remains the Same. made por me :). Images in the Castiel club tagged: supernatural season 5 the song remains the same castiel. 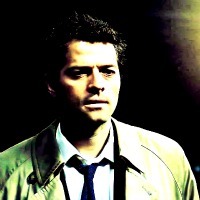 This Castiel icon contains retrato, headshot, close up, and closeup. There might also be workwear, roupa de trabalho, and vestuário de trabalho.